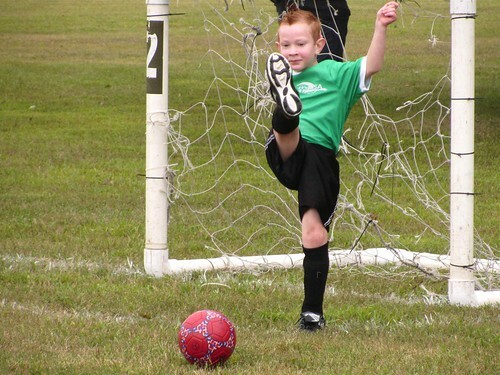 Kade had his first soccer game this morning. He is so happy to be on the same team as his friend Noah. Their team didn't score many goals today but they did have fun. To me that's all that really matters. We were sitting on the side lines with the Stones cheering on the team. It was Kade's turn for a goal kick. He really gave it all he had. I was rather impressed with the effort that went into this kick. I had to look at the picture again. Look at that leg extension. Kade sometimes talks of playing football but I usually try to steer him in the direction of something like baseball or tennis. Maybe sticking with soccer would be a good idea. Then maybe he could become a kicker for a football team, if he still wants to play. Janel - I'll take them whenever I can get them. Thanks!